The Ghana Cyber City is a business innovation hub, comprising workspace and data center for innovative companies; condominiums for knowledge workers and executives; and a commercial center for technology retailers such as Huawei, Samsung, Apple. In collaboration with the Massachusetts Institute of Technology (MIT), Airtel Ghana and corporate partners, the project would promote technology entrepreneurship and incubate African startup firms. Located 3 minutes drive from the international airport in Accra, one of the fastest-growing property markets in West Africa, the Ghana Cyber City offers a sustainable innovative environment and a vibrant business and social community to its corporate, retail and residential tenants. Africa has infrastructure deficit for which the continent needs to invest more than $90 billion a year to address, according to the World Bank. In response to this challenge, the African Development Bank recently launched the Program for Infrastructure Development in Africa (PIDA) to facilitate investments in information technology and other economic pillars such as power, critical to building Africa’s infrastructure. In the race to assemble the building blocks of a more dynamic African economy, the Ghana Cyber City seeks to become the number one developer and manager of intelligent workspace and technology infrastructure best-suited for developing more African innovations such as MPesa, esoko and mPedigree. Management intends to bring all independent hubs, coworking spaces and incubators in Ghana, including MEST, iSpace, mFriday etc to the Ghana Cyber City. 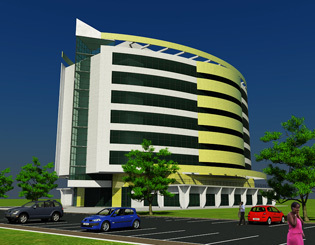 Ghana Cyber City will be positioned as the innovation hub of choice for international companies seeking to enter the West African market, startup firms and entrepreneurs attracted to first class incubation services and local global businesses opting to store their back-up data in a stable African country. The Ghana Cyber City site is three minutes drive the Accra International Airport. The nearby University of Ghana (pop. 30,000) and the Graduate Institute of Management Public Administration (GIMPA, pop. 5,000) will be a source of market-ready knowledge workers and managers, whilst the university community and nearby business hub also constitute a market for modern residential properties in a tech-enabled environment.